A regular breeding resident and migrant; as the breeding population has grown, reports of birds observed during the early months of the winter season are not uncommon, as birds linger before migrating south. The Sandhill Crane was a common species during the Minnesota Breeding Bird Atlas (MNBBA). Widely distributed from Alaska, across Canada and the northern United States; small, nonmigratory populations also occur in southern Georgia, northern Florida, and Cuba. Across southern Canada and the United States some of the densest breeding populations can be found in southeastern Manitoba, south through Minnesota and Wisconsin (Figure 1). Assigned a Continental Concern Score of 8/20 by Partners in Flight and ranked a species of Low Concern by the North American Waterbird Conservation Plan; a game species in portions of its range, including northwestern Minnesota. Officially listed as a Special Concern Species in Minnesota in 1984 but delisted in 1996. Distances traveled depend on the origin of the breeding birds; Minnesota birds are short-distance migrants. Birds in eastern Minnesota migrate southeast to Georgia and Florida; birds in northwestern Minnesota migrate south to the Gulf coast of Texas. Omnivorous and an opportunistic feeder that consumes a wide variety of plants and animals from the ground and shallow waters. A platform of plant material constructed of vegetation pulled from the nest site and either floating in shallow water, anchored to emergent vegetation, or placed in uplands immediately adjacent to the wetland. Breeding distribution and relative abundance of the Sandhill Crane in North America based on the federal Breeding Bird Survey, 2011–2015 (Sauer et al. 2017). Sandhill Cranes stand nearly 1.5 meters tall. Thus, it is no surprise that long before Minnesota became a state in 1858, early explorers and fur traders took note of the Sandhill Crane’s presence across the region’s dry prairies and wet meadows. When explorer and fur trader Alexander Henry visited the Red River valley in 1804, he noted how common the “gray” cranes were near the town of Pembina, North Dakota, immediately across the Red River from Kittson County, Minnesota. William H. Keating’s account of the Long Expedition up the Minnesota and Red River valleys in 1823 included an account of mistaken identity when a large flock of Sandhill Cranes seen along the Minnesota River was initially mistaken for a herd of elk. Members of the party could see so far across the open landscape that it was difficult “to determine with accuracy the nature or size of objects seen at a distance” (Swanson 1940; Nord and Breckenridge 1941). Drought conditions in the 1930s coupled with continued intensification of agricultural practices left few opportunities for this majestic bird to make a comeback, despite the closure of hunting seasons in 1916 under the newly signed Migratory Bird Treaty (Gerber et al. 2014). These conditions combined with the species’ low annual productivity and delayed sexual maturity slowed the pace of recovery. By 1944, Walkinshaw (1949) estimated that only 10 to 25 nesting pairs remained in the wetlands and grasslands of Minnesota’s remote northwestern counties. The Duxby Bog, now the Roseau River Wildlife Management Area, was considered one of the last strongholds (Henderson 1979a). Beginning in the 1950s, the number of reports of nesting birds in the northwest began to increase with accounts from Minnesota Department of Natural Resources field staff and the birding public (e.g., Magnus 1955; Jensen 1959; Bremer 1966). More than 200 miles to the southeast, accounts were being reported from east-central Minnesota and from Morrison, Aitkin, and Anoka Counties (e.g., Grewe 1968; Angell 1961; Longley 1970). It was unclear if the birds in this region of the state were remnants of the former population in the area or if they reflected an expansion of a breeding population from the Crex Meadows Wildlife Area in Grantsburg, Wisconsin (Henderson 1979b). Given the long-standing interest in the species, when the Minnesota Department of Natural Resources launched the Nongame Wildlife Program in 1977, one of its first projects was to assess the statewide status of the Sandhill Crane. From 1977 to 1979, field staff working with state and federal resource agencies, academic institutions, and conservation organizations were asked to submit data on the location, numbers, and habitat use of all cranes they observed. Over the three-year period, the results indicated there were approximately 15 to 25 nesting pairs in east-central Minnesota, and 50 to 68 pairs in the northwest (Henderson 1979b). 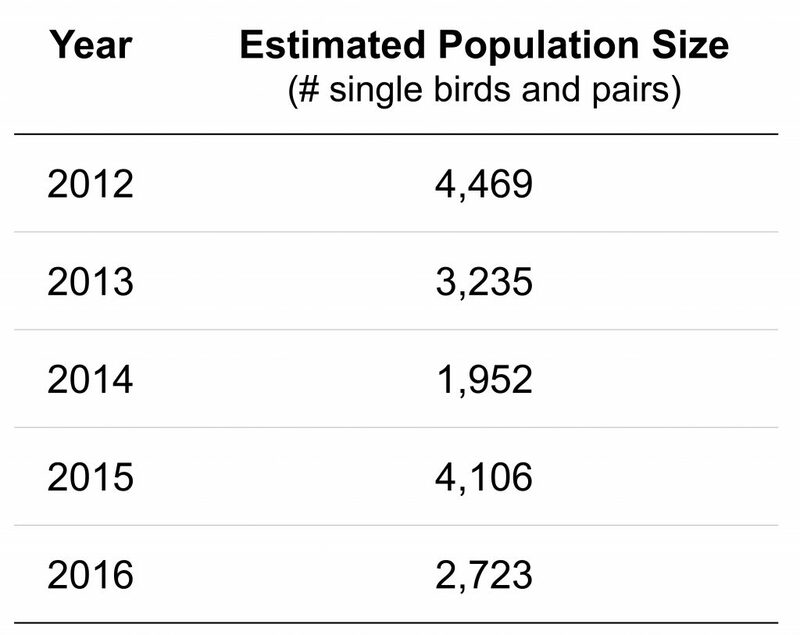 Based on these actual counts, Henderson projected that the statewide population might be as large as 150 to 300 nesting pairs (Henderson 1979a, 1979b). The actual counts, however, were very similar to another assessment by Johnson (1976) of 20 to 25 pairs in east-central Minnesota, and 50 to 60 pairs in the northwest. Clearly cranes had increased in abundance since the turn of the century. These preliminary assessments unleashed a myriad of technical assessments and field studies of Minnesota’s Sandhill Cranes, which continue to this day. In 1985, a comprehensive assessment of the species’ status and distribution in the state, including contacts with resource managers and wildlife researchers statewide, concluded that the population might indeed be much larger than originally thought, consisting of at least 87 to 109 breeding pairs in the east-central region, and 760 to 1,160 nesting pairs in the northwest (Tacha and Tacha 1985). By the early 1980s, as the number of birds increased, the two population centers in the widely separated northwest and east-central regions of the state were beginning to merge. Resident cranes were being reported throughout north-central Minnesota, with reports in Todd, Cass, Hubbard, and Crow Wing Counties constituting a bridge between the formerly isolated centers in the northwest and east-central regions. From a conservation and management standpoint, this was particularly interesting since the birds in northwestern Minnesota were known to migrate to the Gulf coast of Texas, while the birds in east-central Minnesota were known to follow a different course, heading southeast to Georgia and Florida. The birds also pioneered farther south, as evidenced by reports from Stevens, Cottonwood, and Houston Counties (Tacha and Tacha 1985). During the summers of 1994 and 1995, the birds made their first appearance on Minnesota’s federal Breeding Bird Survey (BBS) routes in St. Louis County (#35 and #73). Indeed, their numbers have continued to flourish in the Floodwood region of central St. Louis County, where a landscape matrix of large peatlands interspersed with forests and small farms provides ideal habitat. In the ensuing years, numerous studies have examined the birds’ breeding biology, migratory behavior on staging areas, spatial patterns during the breeding season, nest success, and habitat use (Maxson et al. 1990; Maxson et al. 2008; Herr 1992; Provost 1991; DiMatteo 1992). More recent studies have focused on explicit management issues associated with their burgeoning population (e.g., Krapu et al. 2011; Fronczak 2014; Fronczak et al. 2015). The expanding populations witnessed in the latter half of the 20th century have continued to grow both in distribution and abundance. To date, field biologists with the Minnesota Biological Survey have reported 633 Sandhill Crane breeding season locations distributed across northern Minnesota and including small pockets in the southeast region. The Tallgrass Aspen Parklands Province and counties in the western and southwestern corner of the Laurentian Mixed Forest Province, including Clearwater, Todd, Wadena, and Morrison, supported some of the highest numbers of reports. As of 1998, Hertzel and Janssen had delineated 18 counties where nesting had been confirmed since 1970, ranging from Houston County in the southeast corner to Kittson County in the far northwest. During the MNBBA, observers reported 1,943 Sandhill Cranes records in 24.4% (1,186/4,856) of the surveyed atlas blocks and in 26.7% (623/2,337) of the priority blocks. Breeding evidence was gathered in 6.0% (290) of the surveyed blocks (Figures 2 and 3; Table 1). Overall, the species was reported in 66 of Minnesota’s 87 counties, and breeding evidence was gathered in 52 counties. Southwestern Minnesota was the only region lacking any reports. Cranes were particularly abundant in the northwest Tallgrass Aspen Parklands Province and throughout central and east-central Minnesota, stretching from the northern outskirts of the Twin Cities metropolitan area, north to Aitkin, Cass, and Crow Wing Counties, and west to Kandiyohi County and eastern Pope, Douglas, and Otter Tail Counties. The landcover suitability model prepared for the Sandhill Crane predicts the species’ high abundance in central and northwestern Minnesota east of the intensely cultivated lands of the Red River valley (Figure 4). Small pockets of highly suitable habitat, however, are predicted throughout southern Minnesota. As Henderson (2016) recently pointed out, the Sandhill Crane is a resilient bird that has adapted well to a landscape that has changed in countless ways in the past 100 to 125 years. The species’ recovery in Minnesota has played out in other regions of its breeding range as well. In Wisconsin, a 1973 study estimated a statewide population of only 850 adults distributed across 31 counties. The state’s first atlas, conducted from 1995 to 2000, confirmed breeding in 68 of the state’s 72 counties (Cutright et al. 2006). As successful as the crane’s recovery has been, its current distribution is still believed to be less extensive then it was historically in the early 1800s (Gerber et al. 2014). Breeding distribution of the Sandhill Crane in Minnesota based on the Breeding Bird Atlas (2009 – 2013). Summary statistics of observations by breeding status category for the Sandhill Crane in Minnesota based on all blocks (each 5 km x 5 km) surveyed during the Breeding Bird Atlas (2009-2013). Summary statistics for the Sandhill Crane observations by breeding status category for all blocks and priority blocks (each 5 km x 5 km) surveyed during the Minnesota Breeding Bird Atlas (2009-2013). Landcover suitability of the Sandhill Crane in Minnesota based on habitat, landscape context, and climate data gathered during the Minnesota Breeding Bird Atlas (2009-2013) using the MaxEnt modeling approach. An inhabitant of open landscapes, the Sandhill Crane is most closely associated with large, isolated wetlands that are surrounded by shrublands, woodlands, grasslands, and agricultural fields (Figure 5). Within Minnesota, wetlands can include (1) the extensive open peatlands and wet meadows of the Tallgrass Aspen Parklands Province; (2) large, managed wetland complexes at sites, such as the Sherburne National Wildlife Refuge and the Carlos Avery Wildlife Management Area in east-central Minnesota; and (3) backwater wetlands of the Lower Mississippi River floodplain in the southeast. Tacha and Tacha (1985) summarized suitable breeding habitat as comprising “any large, shallow, relatively open, isolated wetland adjacent to open, upland foraging areas.” Wetlands owned and managed by the Minnesota Department of Natural Resources and the U.S. Fish and Wildlife Service provide a significant amount of the habitat currently used by the species. Habitat data collected within 200 m of MNBBA point counts where Sandhill Cranes were detected demonstrate the species’ strong association with shrub wetlands, marshes and wet meadows, and upland grasslands (Figure 6). Despite their overall variability, suitable breeding areas always contain four primary elements: water, nesting cover, isolation, and a nearby foraging area (Provost 1991). Although one study demonstrated that birds were not found on sites where the water was deeper than 35.7 cm in northwestern Minnesota, depredation occurred significantly more often when nests were placed on sites where the water was less than 9.7 cm deep (Maxson et al. 2008). Shallow water depths allow easier access to nests by mammalian predators. Nests placed in shallow waters also are more likely to be inundated when water levels rise due to heavy rain events. Moderately dense stands of emergent vegetation (cattails, sedges, phragmites, and bulrush) that can conceal the nest are important. Low shrub densities are preferred; as shrub density increases, sites become less suitable (Tacha and Tacha 1985). Sites where the vegetation is so dense that it restricts access and the ability of the birds to view their surroundings are usually avoided (Maxson et al. 2008). Overall, the species’ composition of the vegetation is less important than structure. Although many nest sites are isolated, the birds do not appear to be restricted to large wetland basins. In northwestern Minnesota, for example, Provost (1991) found birds nesting in wetlands as small as 0.6 ha and as large as 1,862 ha. Finally, once the young have hatched, the family forages in the shallow wetlands and in adjacent grasslands and agricultural fields. Nonbreeding adults are found throughout the summer months in upland habitats, including hayfields, fallow fields, and small grain fields (Provost 1991). Typical breeding habitat of the Sandhill Crane in Minnesota (©Lee A. Pfannmuller). Habitat profile for the Sandhill Crane based on habitats within 200 m of point counts where the species was present during the Minnesota Breeding Bird Atlas (2009-2013). In 2010, the North American Sandhill Crane population was estimated at approximately 650,000 individuals (Wires et al. 2010). This estimate was based on broad estimates of each major North American population generated in the 1990s. Recently, state and federal agencies have conducted surveys that provided more precise estimates, resulting in an estimate of 507,000 individuals (Gerber et al. 2014). It is unclear if this recent estimate represents a population decline or simply reflects more accurate survey estimates. Long-term, however, the population has definitely increased; in 1975, the North American population estimate was 285,000 to 320,000 birds (Drewien et al. 1975). Apart from the approximations of statewide estimates provided by biologists in the 1970s and 1980s (e.g., Henderson 1979b; Tacha and Tacha 1985), there has never been an in-depth statewide assessment or survey of Minnesota’s Sandhill Crane population. As the population expanded and interest in initiating a hunting season in northwestern Minnesota grew, the Minnesota Department of Natural Resources added cranes to their annual August roadside pheasant survey in 2009. Since the surveys began, the number of cranes seen statewide has averaged 10 birds per 160 km. Regionally, the greatest numbers are seen in the east-central survey region (average of 40 birds per 160 km), followed by the northwest region (average 25 birds per 160 km; Davros 2015). Once a limited Sandhill Crane harvest season was launched in the fall of 2010 in northwestern Minnesota, the department also initiated a far more intensive regional survey to properly track potential impacts of the harvest on the local breeding population (Lawrence et al. 2016). The survey has been conducted each May since 2012. The population has ranged from a high of 4,469 birds in 2012 to a low of 1,952 birds in 2014 (Table 2). The data set is still too short to determine if there is impact to the local breeding population from the fall harvest, but Lawrence and his colleagues point to several factors that may be influencing annual variations. These include variability in the arrival of resident nonbreeding birds and variable habitat conditions from year to year. Given that the August roadside count indicates significantly larger populations in east-central Minnesota, the May survey represents only a fraction of the statewide population. Both surveys will need to continue for more years before long-term trends will be discernable. The federal BBS continues to provide a reliable indicator of long-term population trends across North America as well as in Minnesota. Survey-wide, since 1966 cranes have demonstrated a statistically significant annual increase of 4.74% per year; since 2005 the rate of increase has been even steeper, at 7.23% per year (Sauer et al. 2017). The upward trend is even more dramatic in Minnesota, where the birds have increased an average of 9.74% since 1967, and 10.80% since 2005 (Figure 7). Indeed, northwestern and east-central Minnesota now support some of the densest breeding concentrations seen across North America (Figure 1). Sandhill Crane breeding ground survey results in northwestern Minnesota, 2012–2016 (Lawrence et al. 2016). 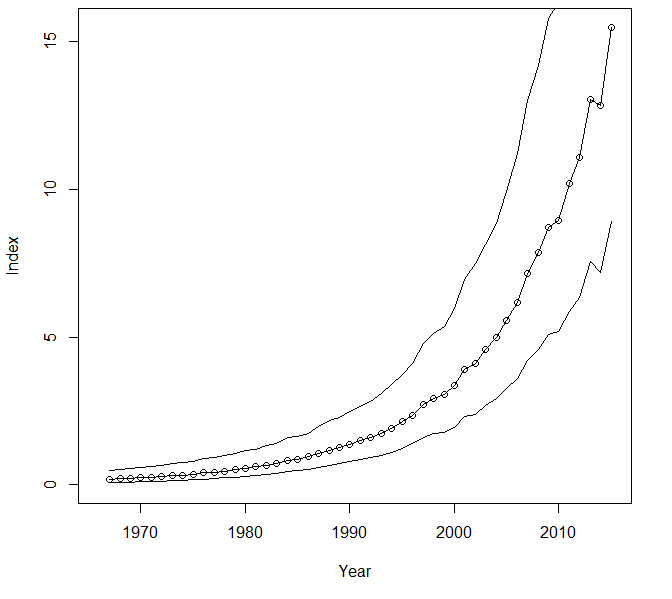 Breeding population trend for the Sandhill Crane in Minnesota for 1967–2015 based on the federal Breeding Bird Survey (Sauer et al. 2017). Partners in Flight (2017) has assigned the Sandhill Crane a moderately low Continental Concern Score of 8/20 while the North American Waterbird Conservation Plan (2006) ranked it as a species of Low Concern. In Minnesota, the crane was officially listed as a state Special Concern Species in 1984 (Coffin and Pfannmuller 1988), prompted largely by concerns regarding the availability of suitable habitat as agricultural practices continued to intensify and wetland acres continued to be drained. Yet, despite such concerns, the species continued to prosper, and the crane was delisted in 1996. Wildlife managers and research biologists all agree that the crane’s future rests entirely on habitat availability. At the heart of the crane’s remarkable recovery have been aggressive efforts to protect and restore shallow wetland habitats since the mid-1900s. Success, however, always begets both opportunities and challenges. Hunting cranes, for example, is a long-established tradition and one that nearly brought the species to its demise. As a result, when the Migratory Bird Treaty was first signed in 1916, hunting seasons were closed in both Canada and the United States. Forty-five years passed before numbers began to rebound, prompting the reinstatement of hunting opportunities in Saskatchewan in 1959, and in New Mexico, Texas, and Alaska in 1961. Local populations of resident and migrant cranes not only were rebounding but were beginning to cause damage to unharvested grain crops in Canada’s Prairie Provinces and the northern Great Plains (Drewien et al. 1975). Since then, as populations continued to increase and interest in hunting the popular game bird was rekindled, hunting opportunities have continued to expand. Today, the harvest and management of Sandhill Crane populations are overseen by four national Flyway Councils, each a partnership between the U.S. Fish and Wildlife Service and state resource agencies, one for each major migratory flyway. Each flyway manages several different populations of cranes, two of which occur in Minnesota: the midcontinent population, which includes northwestern Minnesota and is managed by the Central Flyway, and the eastern population, which includes east-central Minnesota and is managed by the Mississippi Flyway. States west of Minnesota that support migrant birds from the midcontinent population reinstated hunting seasons many years ago. Minnesota, however, delayed until recently, when the first hunting season since 1916 was reopened in 2010. The season is restricted to all or portions of 8 counties in the northwest corner of the state, where cranes are part of the healthy and steadily growing midcontinent population. Although permitted under the eastern population plan, at present hunting is not open on Minnesota’s portion of the eastern population. During the fall hunting season, Minnesota’s northwestern counties support resident breeding cranes as well as migrants heading south from Canada. As a result, some have expressed concern regarding the hunting season’s potential impact to the local breeding population. Harvest, however, has steadily declined since the season first opened, with 830 birds taken in 2010 and only 212 in 2015 (Dubovsky 2016). The initial interest seems to have waned somewhat as hunters learn the challenges of hunting such wary targets. Nevertheless, adjustments to the hunting season continue to be made to insure that the harvest is primarily focused on migrants and that the local breeding population is managed sustainably. Meanwhile, as populations increase statewide, so do crop depredation complaints by farmers. The problem is particularly troublesome in the spring, when newly planted corn provides a tasty treat to migrating cranes. A nonlethal repellent, Avipel, is available to help discourage depredation, but continuing complaints are also fueling a growing interest in opening a season in eastern and central Minnesota as well. Studies are now underway to examine these populations more closely. Finally, like so many wetland-dependent species, the influence of warming temperatures on current populations is a growing concern. A recent modeling exercise by National Audubon predicted that climate change could have a significant impact on the crane’s coastal wintering habitats, of which 58% are predicted to be lost by the year 2080 (Langham et al. 2015; National Audubon Society 2016). In the interim, we can marvel at the remarkable recovery that Sandhill Cranes have made in the state and work to ensure that their future remains bright. Angell, LeRoy. 1961. “Sandhill Cranes.” Flicker 33: 125. Bremer, Paul E. 1966. “Possible Sandhill Crane Breeding.” Loon 38: 139. DiMatteo, Jon J. 1992. “Status, Production and Migration of Greater Sandhill Cranes on Agassiz National Wildlife Refuge, Minnesota.” In Proceedings 1988 North American Crane Workshop edited by Don A. Wood, 13–20. State of Florida Game and Fresh Water Fish Commission Nongame Wildlife Program Technical Report 12. Drewien, Rod C., Carroll D. Littlefield, Lawrence H. Walkinshaw, and C. E. Brown. 1975. “Conservation Committee Report on Status of Sandhill Cranes.” Wilson Bulletin 87: 297–302. Fronczak, David L. 2014. “Distribution, Migration Chronology, and Survival Rates of Eastern Population Sandhill Cranes.” MS thesis, University of Minnesota. Fronczak, David L., David E. Andersen, Everett E. Hanna, and Thomas R. Cooper. 2015. “Annual Survival Rate Estimate of Satellite Transmitter-Marked Eastern Population Greater Sandhill Cranes.” Journal of Fish and Wildlife Management 6: 464–471. Grewe, Al. 1968. “Sandhill Cranes in Morrison County.” Loon 30: 159. Henderson, Carroll L. 1979a. “Last Call for Cranes?” Minnesota Conservation Volunteer 42(May/June): 48–57. Henderson, Carroll L. 2016. “The Resilience of Sandhill Cranes.” Minnesota Conservation Volunteer 79(March/April): 8–19. Jensen, Jack R. 1959. “Sandhill Cranes in Roseau County.” Loon 31: 138. Krapu, Gary L., David A. Brandt, Kenneth L. Jones, and Douglas H. Johnson. 2011. “Geographic Distribution of the Mid-Continent Population of Sandhill Cranes and Related Management Applications.” Wildlife Monographs 175: 1–38. Lawrence, Jeffrey S., John H. Giudice, and Robert G. Wright. 2016. 2016 Northwest Minnesota Sandhill Crane Breeding Ground Survey. Minnesota Department of Natural Resources. Longley, William H. 1970. “Sandhill Cranes at the Carlos Avery Wildlife Area.” Loon 42: 124–128. Magnus, Lester T. 1955. “Sandhill Cranes on the Roseau River Refuge and Public Hunting Grounds, Roseau, Minnesota.” Loon 27: 93. Maxson, Stephen J., Jodie L. Provost, and George H. Davis. 1990. “Fall Migration of Sandhill Cranes in Northwestern Minnesota, 1988–89.” Loon 62: 14–19. Maxson, Stephen J., John R. Fieberg, and Michael R. Riggs. 2008. “Sandhill Crane Nest Habitat Selection and Factors Affecting Nest Success in Northwestern Minnesota.” In Proceedings of the Tenth North American Crane Workshop, Feb. 7-10, 2006, Zacatecas City, Zacatecas, Mexico, edited by Martin J. Folk and Steve A. Nesbitt, 90–97. North American Crane Working Group. Nord, W. H., and Walter John Breckenridge. 1941. “Record Flight of Sandhill Cranes.” Flicker 13: 2–4. Walkinshaw, Lawrence H. 1949. The Sandhill Cranes. Institute of Science Bulletin, no. 29. Bloomfield Hills, MI: Cranbrook.